Super-compact DJ audio interface with two stereo outputs and full version of the flagship TRAKTOR PRO 2.5 with Remix Decks™ included. TRAKTOR AUDIO 2 is the smallest USB DJ soundcard in the world, yet packs enough punch to rock the world’s biggest clubs. Built using the same technology as the acclaimed, award-winning range of TRAKTOR interfaces, TRAKTOR AUDIO 2 comes with the full version of the flagship DJ softwareTRAKTOR PRO 2.5 with Remix Decks* included! Get flexible connectivity, pristine sound and a host of included software with this low-latency interface. KOMPLETE never sounded so good. Please note that the MASCHINE STAND is not compatible with MASCHINE MIKRO. TRAKTOR DJ CABLE is the quality audio splitter for TRAKTOR DJ. Pre-listen to your next track for crowd-worthy, flawless mixing on portable DJ setups. TRAKTOR DJ CABLE lets you pre-listen to your next track before it hits the audience and keeps you ready for action anywhere, anytime. When used withTRAKTOR DJ orTRAKTOR PRO 2, TRAKTOR DJ CABLE splits the audio from your virtual decks, allowing you to mix like a pro. Create and perform rhythms, harmonies, and melodies faster than you ever thought possible. MASCHINE STUDIO’s workflow keeps you laser-focused on the quest for the perfect groove. Its pattern-based sequencer and high-performance sampler, exemplary drum synths, incredible suite of creative effects and pro instruments, and acclaimed sound library deliver ultimate production power. TRAKTOR AUDIO 2 is the world’s smallest DJ soundcard for TRAKTOR DJ and TRAKTOR PRO 2*. Portable, pristine audio – packed with wall-shaking power. The world’s leading collection for production, performance, and sound design. 45 products, over 13,000 sounds, and more than 155 GB of instruments and effects. The tools you need for every production task and any type of music. 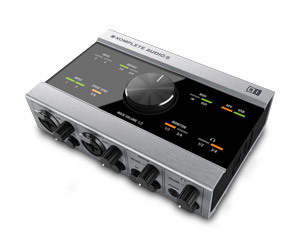 Discounted upgrade path for current owners of Komplete Ultimate.